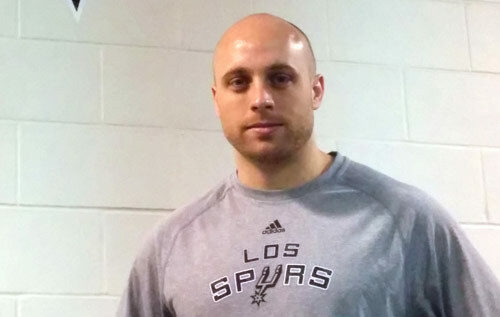 Before the start of this season, Bermudian Matt Herring achieved a professional breakthrough after he was appointed one of the San Antonio Spurs’ strength and conditioning coaches. Since then, life’s been hectic as he spends every day with the team at home in Texas and on the road, getting the players in peak condition for the court. After studying in Swansea, Wales and Edinburgh, Scotland — he has a BSc in Sports Science and an MSc in Strength and Conditioning, to name just some of his qualifications — and working at UCSB, things got even more full-on. But as the Spurs battle it out in the NBA post-season, Herring found time to talk to the Bermuda Sun about life in the fast lane. Question: The Spurs have a superb record on the road in the NBA this season — so what’s it like travelling with such a high-profile organization? The travelling is one of the most difficult aspects of the job but, in some ways, it is very special. We can be in four different cities in a week. I travel with the team at all times and there is great camaraderie. It’s funny how everyone envisions it as a life of luxury, and we certainly do travel in style, but at the same time, there is constant focus on the task at hand. Preparing the team for each game is my primary focus but, at the Spurs, we all pitch in to help each other on a road trip. Selflessness is the common thread throughout the whole organization. Whether it is unloading luggage at 3am in -20 degree temperatures in Milwaukee with the support staff or warming up the team before a Miami Heat game, I’m ready to work at all times. I do try to make an effort to see each city and I am lucky that Bermudians are everywhere. It is always great to meet up with people from home. What’s a typical match day like for you? And how key is the relationship with the coach? I am with the team at all times — in the locker-room before the game, at half-time, and after the game. I warm up and stretch the players, and also sit right behind the bench during each game. I am a strength and conditioning coach, so I don’t actually treat injuries at games, as that is primarily the responsibility of the athletic trainers. I am very lucky to work with coach Gregg Popovich. He is a leader in every sense of the word and one of the most successful coaches in the NBA. I learn each day from him in terms of how to best coach and motivate players and also how to conduct myself in the most professional manner. Have there been any moments that have had you pinching yourself in disbelief at what you’re now doing for a living? I try my best to take the whole experience in but this lifestyle is usually too hectic to really take a step back and enjoy the view! There have been a few experiences that have forced me to pinch myself. I have been lucky to share the experiences of a few iconic stadiums with my family, as my brother came to Madison Square Garden to watch us play the New York Knicks and my parents came to Boston for our game against the Celtics at TD Garden. My parents and sister also came to San Antonio to watch us play the Houston Rockets. These experiences are the most special to me as, if it was not for them, I wouldn’t be where I am today. Playing the Los Angeles Lakers at the Staples Center also gave me goosebumps, as I have a strong connection with Southern California after working for the University of California, Santa Barbara, and I would watch the Lakers regularly with friends. Another great experience was seeing Scottie Pippen at our game in Chicago. I also had a chance to meet Hakeem ‘The Dream’ Olajuwon when we played in Houston. These men were superheroes to me when I was growing up, so I had to take a deep breath and introduce myself. They were very brief encounters, but ones I will never forget. One question I am often asked by my friends is ‘who is the coolest celebrity that I have seen at a game?’ There have been many to choose from, but Carlos Santana and Tommy Lee Jones have been the most exciting for me. Is working in elite sport something you’ve always wanted to do? I come from a sport-obsessed family and I competed in football, swimming, cycling and triathlon from a young age. That is where I caught the bug of learning how athletes can reach their athletic potential by applying cutting-edge sports science to their training programmes. I was also very interested in coaching and would read autobiographies of all the top football coaches of the past and the present, like Bill Shankly, Jose Mourinho and Bob Paisley. Scottie Pippen, Patrick Ewing, Shaquille O’Neill, Kevin Garnett, Tim Duncan and, of course, Michael Jordan. Have you suggested an off-season training camp in Bermuda yet? I have mentioned it a few times! I think it would be fantastic and a lot of fun for the team. I would love to introduce the guys to my home. Sometimes I feel I work for the Bermuda Tourism Board as well!